Noida: A first ever Indo Iraq Film And Cultural Forum has been created by the Embassy of Iraq in India in association with International Chamber of Media And Entertainment Industry. In a grand function Indo Iraq Film And Cultural Forum was formally inaugurated by H E Dr. Falah Abdulhasan Abdulsada Ambassador of Iraq to India to develop and promote relation between two countries through arts and culture in the presence of film, television, media art and cultural representatives of the industry. “We believe that relations between two countries can be developed to new platform through arts and culture. We are now keen in exchanging our culture by launching a forum like this,” said H.E. Dr. Falah Abdulhasan Abdulsada Ambassador of Iraq to India. “This is another feather in the cap of International Chamber of Media And Entertainment Industry with the opening of new chapter on Iraq. We have already entertained people from Iraq earlier in our different international summits. 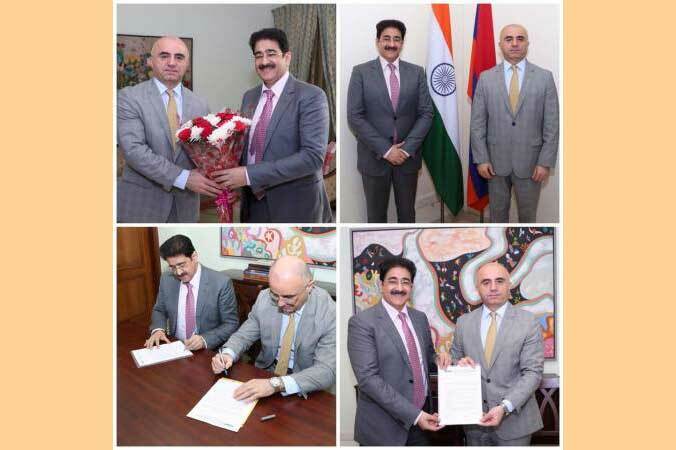 It is a day of celebration,” said Dr. Sandeep Marwah President of ICMEI. A poster was released to mark respect to the decision of launching of forum. Dr. Sandeep Marwah presented a project report on Iraq to Ambassador Prepared by the students of AAFT under Students Committee on Iraq. Where Dr. Falah Abdulhasan Abdulsada was presented with the memento for the Patronship of Indo Iraq Film And Cultural Forum, there Dr. Abdulhasan also horned and presented the responsibility of Chair of the forum to Dr. Sandeep Marwah. Soon ICMEI and Embassy of Iraq will sign MOU in coming days to strengthen the relation between two countries.